OTI Lumionics received a $5.7 million CAD ($4.55 million USD) grant from the Canadian government to build an OLED lighting pilot production line in Canada. The company says that the new line will enable them to produce large flexible OLED lighting panels. 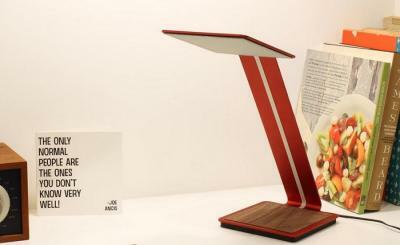 OTI unveiled their first OLED lighting product, the Aerelight desk lamp (shown above), in September 2014. It uses a single 1000 lux OLED lighting panel and costs $239. The lamp started shipping recently. Last year we posted an article explaining the company's technology and business model. The company aims to build a small-scale OLED fab, that works "on demand" and offers customized production, which means that the OLED panel is tailored to the final application.